About 3% of residential water use goes to outdoor watering, including lawns. By effectively using water and reducing wasteful practices such as improper watering you will create deep, vigorous root systems and help the lawn be more resistant to drought conditions. The following techniques are beneficial for healthy turf. Aeration – Creating holes or slits so that air and water can penetrate beneath the surface will improve drainage and stimulate new roots that provide the lawn more resistance to drought for the summer ahead. Aeration can be done in the spring or fall, but it is best done when soil conditions are moist. This ensures that the aerator will pull deeper plugs. The plugs should be 3 to 4 inches deep for best results. Mowing – It is best to mow often, but not too close. Cutting the lawn to the recommended height is healthier during drought conditions. Bluegrass, fescue and ryegrass should be mowed at a height of 3 inches. Longer grass has more leaf surface to absorb greater amounts of sunlight, encouraging thicker turf with a deeper root system. Lawn grasses are rarely killed by droughts. 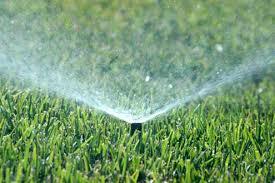 Proper watering practices will help conserve water and save money, while maintaining an attractive and healthy lawn.